Africans in America/Part 3/Is Miss Dinah at Home? "Is Miss Dinah at Home? " click image for close-up This cartoon, originally drawn by Edward Williams Clay as one of fourteen in a series called "Life in Philadelphia," satirized the social conventions adopted by Philadelphia's blacks. 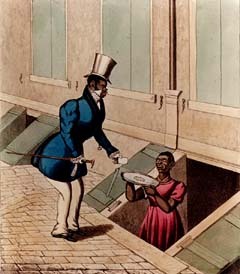 In the cartoon, a well dressed black man converses with a black woman, who holds forth a tray from a cellar door. He asks, "Is Miss Dinah at home? She replies, "Yes sir but she bery potickly engaged in washing de dishes." He says, "Ah! I'm sorry I cant have the honour to pay my devours to her. Give her my card."